Facebook was launched as recently as 2004 but in a world that changes at an ever-increasing pace, social media is now the dominant force on the World Wide Web and Silverpop.com has taken a look at this quickly morphing phenomenon over the last decade. Social media sites are where most of us spend most of our time. And the share is only going to grow. In 2012, Nielsen’s figures on US social media use recorded an increase of 37 per cent in the time spent on social sites in just one year. Today’s top five social media sites are: Facebook with one billion users and rising, Twitter with 500 million tweeters, Google+ is rising with 400 million users while the fourth and fifth sites are the Chinese networks Weibo, their Facebook (the US one is banned) and Twitter-alike RenRen. LinkedIn and Instagram are closing in on the big five while Badoo – a dating network that’s big in Latin America – sits at number seven. Social networks seem to have a natural life pattern too, as Silverpop points out. That is, it’s easy to grow for the first three years as the world gets excited by a novel new toy (nine out of 11 sampled companies did). But then things get tougher and only five of their sample went on to grow in years four, five and six. But getting over the third year hump could mean a site is on to something that will last. Here are the fourth year membership growth figures for some of the big boys: Twitter grew by a factor of eight, Facebook by six and Tumblr – which is 10th in the survey – grew up to four times. Silverpop picks out some stars of the future, which marketers may want to focus their efforts on. Foursquare, Instagram (despite its recent troubles) and Tumblr have expanded with widespread smartphone use. And three new sites – Path, Pinterest and audio sharing site Soundcloud – are still young but growing very vigorously. Growing slowly but steadily are LinkedIn, Yelp (yes, Yelp is social) and photo site Flickr, which had a big boost from Instagram’s privacy settings own goal. The New Year started badly for Microsoft as the world got used to its warning that some versions of Internet Explorer (IE) were vulnerable to hacking attacks. The bug came to light when the website of the American think tank the Council of Foreign Relations was infected with malware which could be downloaded by site visitors with versions 6, 7 and 8 of the web browser. The world of hacking is jargon heavy, and this attack has been dubbed a ‘watering hole attack’. This type of attack targets a particular organisation not directly but through websites its members are likely to use. As the Council of Foreign Relations is a hugely prestigious Washington institution – both the Clintons and America’s probable next Secretary of State John Kerry are members – with deep connections to the country’s political elite it’s being speculated that spooks from a foreign government (China is the favourite) may be behind the attack. It’s also what’s known as a ‘zero day’ attack. This means that it targets a previously unknown vulnerability in software. Web browsers are particularly vulnerable to this sort of dirty dealing. Microsoft has reacted by publishing a security advisory. However, their best advice was to upgrade to IE 9 or 10, which can’t be attacked with this particular hack. This isn’t an option for anyone using Windows XP, who will have to wait for the release of a Microsoft patch sealing up the security hole. Your web browser is your window on the world wide web and, along with email, it’s the easiest way for hackers to get control of your machine or load it with malicious software. IE is shipped with millions of computers and many – particularly new – users are quite happy to go with what comes out of the box. But changing your web browser isn’t difficult at all; the programme installation will talk you steadily through every step and even transfer all your bookmarks and favourites as part of the process. And, all the leading players are completely free too. Williams Shipping are a company with multiple facets. 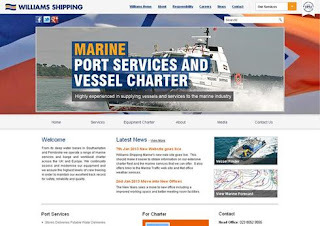 The website we have chosen this week is the redesign for the Marine facet. As a company that has been in business for over 100 years, Williams Shipping offer many marine services, such as workboat chartering and safety boats. The main focus of this website is to showcase the different services the company offers, which is shown in the use of an orange accent colour. This accent is used to highlight the parts of the website that are most important, almost like a call to action. The website has bespoke page dressing created for its Home, Equipment Charter, Media, Contact and About pages. These all follows the same colour scheme as the previous website, but the intricate wireframe work allows for a more sleek and professional design. Williams Shipping also purchased Pro Pack. This allows them to have dropdowns on their menu (which, again, are styled accordingly) as well as the functionality to have a different header per page. This, like the page dressing, gives the website a more professional feel.